Note: The Canon EF-S 18-55mm f/3.5-5.6 II Lens has been replaced by the Canon EF-S 18-55mm f/3.5-5.6 IS Lens. The Canon EF-S 18-55mm f/3.5-5.6 II Lens is currently available only as part of a Canon DSLR kit - or used. 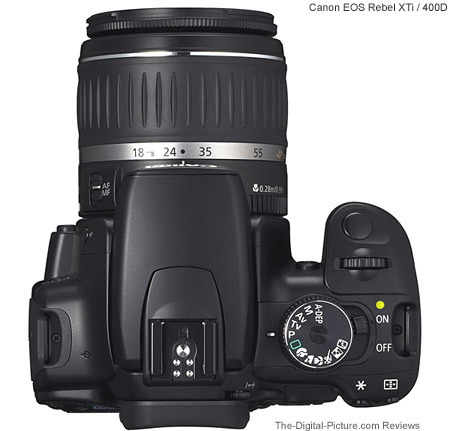 It is designed as a starter/beginner lens that is low cost. You do not pay much for this lens, and you see this in its the construction quality. The first sign is the plastic lens mount. Actually, everything on the outside is plastic except for the lens glass. The advantage to this construction (besides low cost) is low weight - the 18-55 weighs an extremely light 6.7 oz (190g). This lens is small as well - 2.6" x 2.7" (69mm x 66.2mm). There is no distance window on the 18-55 II. The tiny manual focusing ring is barely usable and is located on the end of the extending objective end of the lens. This lens is not meant for serious manual focusing as the object end of the inner barrel wobbles significantly when holding the MF ring - this moves the image in the viewfinder. This lens is shortest at around 35mm and extends to maximum length at either end of the focal length range. A micro motor autofocus drive means you will hear the autofocus action but it is not too slow. There is no FTM (Full Time Manual) focusing. The large zoom ring is easy to find with no manual focus ring in the way. The Canon EF-S 18-55mm f/3.5-5.6 II Lens exhibits moderate and somewhat unique barrel distortion at 18mm. The corners are fine, but there is a blob of distortion over a good portion of the middle of the image. Distortion clears up around 30mm and relatively minor pincushion distortion is present through the balance of the focal length range. The 18-55 has noticeable light fall-off with a wide open aperture at the wider half of the focal length range. You can expect more vignetting from an EF-S mount lens than from a similar EF mount lens on the same 1.6x FOVCF body, and there is with the 18-55. However, the 18-55 performs better than the Canon EF-S 17-85mm Lens at the lower focal lengths in this regard. The Canon EF-S 18-55mm f/3.5-5.6 II Lens is somewhat soft (not sharp) wide open, especially at the longer half of the focal length range. The 18mm corners are extra soft while corners at 55mm are unique to this lens' performance - they are quite sharp wide open. For the most part, if you can shoot at f/5.6 (or f/8 at the long end), this lens does an OK job with image sharpness. The image begins getting softer at f/11 - this is not unusual as diffraction begins to affect image quality at this point. Shooting at or narrower than f/5.6 with no image stabilization means that this lens is going to need some help in lower light levels - a flash to stop action or a tripod to stop camera motion. Higher (noisier) ISO settings will be called upon more frequently when using this lens. Image sharpness aperture considerations aside, this is still not a fast aperture lens. An f/3.5 18mm lens is not bad, f/4 at 25mm and f/4.5 at 31mm are OK, but an f/5.0 35mm or f/5.6 55mm lens is among the slowest lenses made. Blurred backgrounds will not be easy to create with these available aperture and focal lengths. A six-bladed aperture is not going to give the 18-55 any background blur quality advantages when shooting stopped down. Another unique attribute to the 18-55 II is the CA (Chromatic Aberration) it exhibits in the non-center portion of the image. Unique is that the CA is most noticeable at and beyond f/8 at all but the longest focal lengths. So just when the image is getting sharp, CA starts to show up. The amount of CA is noticeable but not terrible. Pictured above from left to right are the Canon EF-S 18-55mm f/3.5-5.6 Lens, Canon EF-S 60mm f/2.8 USM Lens, Canon EF-S 10-22mm f/3.5-4.5 USM Lens, Canon EF-S 17-85mm f/4-5.6 IS USM Lens and Canon EF-S 17-55mm f/2.8 IS USM Lens. The same lenses are pictured fully extended below. With a minimum focus distance of 0.92' (0.28m), the 18-55 delivers a nice native maximum magnification of .28x at 55mm. Adding extension tubes yields a dramatic increase in this number - to near 1:1 macro figures of .81x and .92x with 12mm and 25mm tubes respectively. The 18-55 has a 58mm filter size - the relatively small size = relatively small cost. I don't recommend using protective filters on this lens as decent ones cost half as much as the lens itself. Of course that is your choice to make. Circular polarizer filters, however, are useful on most lenses as they alter the light reaching the sensor. The rotating front lens element makes CP filter use difficult on this lens. The Canon EW-60C lens hood is optional as is the Canon LP814 Lens Pouch. The Lowepro Lens Case 1S would be a better storage option in my opinion. This "Short-Back Focus" lens is usable only on a Canon EF-S-compatible DSLR (larger-sensor camera mirrors will hit the back of this lens). The 1.6x 18-55mm field of view equates to a 28.8-88mm field of view on these DSLRS. This covers the focal lengths Canon generally targets for their general purpose lenses. For the additional price of a DSLR kit over the DSLR body alone, the 18-55 II is not a bad value. It is a nice beginner/starter lens. It makes the cost of a camera/lens kit more manageable until a better lens can be afforded. If you are using this lens, you might be surprised by the image quality your DSLR can produce with some of the better lenses. Even the Canon EF-S 18-55mm f/3.5-5.6 IS Lens is a nice upgrade from this lens. The Canon EF-S 18-55mm f/3.5-5.6 II Lens is only available as part of a Canon EOS camera body kit - or used. Since many people decide to upgrade from their kit lens at some point, this lens can often be found in the used lens marketplace. The buy button will point you to the USM version which has a better focusing motor. 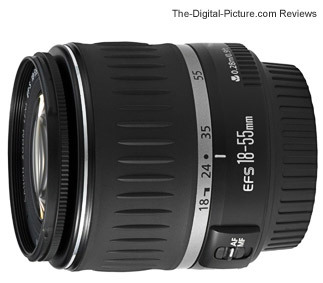 Another note: The 18-55mm lens pictures in this review are of 18-55 II version "I". The test images provided with this review were shot with the version "II" lens. According to Canon, only very slight cosmetic changes were made for the "II" designation. "The major changes are the shape of the zoom ring rubber grip and the tapered area at the front of the lens." (Canon) These two lenses share the same manufacturer MTF charts.